First up I wish I could get hold of a vinyl copy of this record…unfortunately all I have is a MP3 download which does not really give the depth and analogue fell which this music requires. They are both really fine albums and need to be considered together. Starting off with “The Death of John Hall D.Y.” one clearly hears the tune from David Crosby’s “8 Miles High” masterpiece for The Byrds which takes us back into the sunny 1960’s. They continue with a dash of Marvin Gay “I Heard it on the Grapevine” mixed in with some Credence Clearwater revival..on “Boogin” which has a lovely long guitar jam which is up among the best. The Movement then go off blowing a “Shady Wind” into our ears which surges into “Two Tongues” which is a dead ringer for an early Stranglers record. “Great Deceiver” sends us into the great Organ territory of Ray Manzarek and the Doors mixing with Arthur Lee and Love at their best! Side two starts with “All The Lost”, “David’s Song”, “Like Elephant’s 1”, “Ingenting Kommer Ur Ingenting”; One really needs to listen to these tracks as a whole. It reminds me of the Pink Floyd surging into early Hawkwind and back again in a most delightful way. It shows how The Movements musicianship is up there with the very best. The penultimate track ends with a short nod at Neil Young’s feedback frenzy of “Weld”. Like Elephants 1 ends with “It Takes A Spark” which takes us back to the beginning song with the Dylan-Byrds sound and leaves me contented with the lines “The first thing you said to me was the last thing on my mind!”. The second set shows The Movements “have Class” as Jason told me – and indeed this second album put a smile on to this old Hippies’ face. Do you remember the first track on side two of Gerry Garcia’s first solo album? The opening track “Six Feet Under” reminds one of it but on Like Elephants 2 the Movements find their own sound mixing all of the influences from the past. Here we have a 60’s sound with a Gothic twist which needs to be listened to at one sitting. Stand out tracks include “Ice cold” with its simple lyrical rhythm,”Give it To Me” with its deep bass and church organ belting out a repetitive rhythm-with lovely little twists of bagpipe sounds layered over. “Redemption” introduces a wonderful steel guitar. 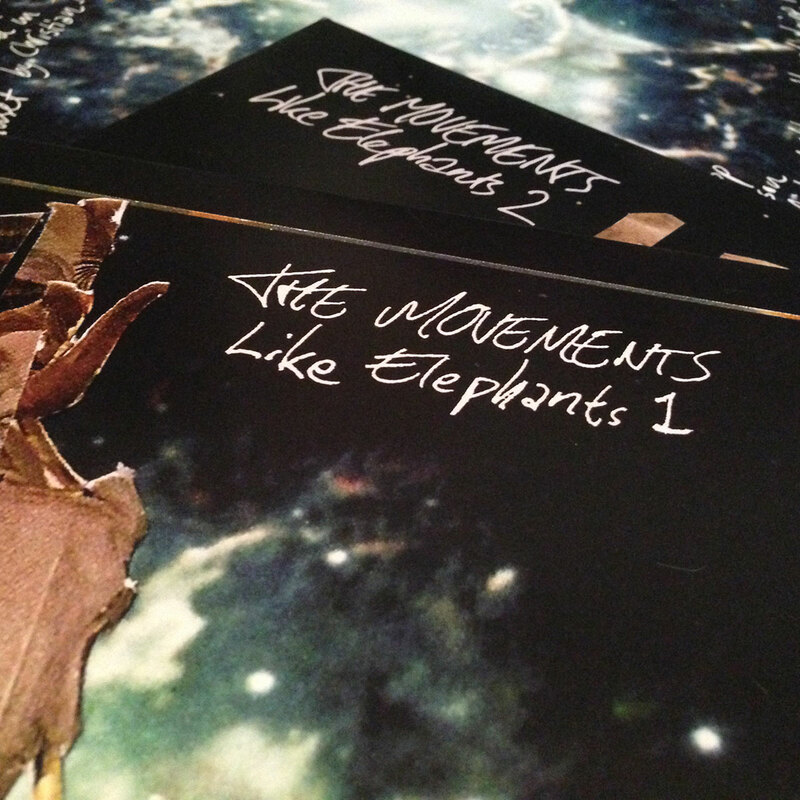 To sum up Like Elephants 1&2 is a worthy contender for album of the year. The Movements hit all the right notes and are well worth a listen.